Antipathy towards Muslims and Islam has been around in America since before I came to this country in 1974, but back then, it was considered rude to state such negative sentiments in public. This all changed on September 11, 2001 when a group of people decided to fly commercial airplanes into the Twin towers, resulting in fires which brought the buildings down, killing almost 3000 people in the buildings. The perpetrators were identified as Muslim and overnight, it became an act of patriotism and righteousness, to bash Islam and Muslims. President George W. Bush declared “War!” on “the enemy” (“War on Terror”) without defining “the enemy” by nationhood, or geographic boundaries, thus ensuring endless battles against an indefinable “enemy”. His Attorney General John Ashcroft, presented Congress with the infamous USAPATRIOT Act which gave broad and deliberately vague powers to the Administration, to pursue “the enemy”, a term which by now, had been recognized to mean “Muslims”. In short order, John Ashcroft had imprisoned over 14,000 Muslims around the US as “potential suspects” who, in their collective, would produce a “mosaic”, which would reveal the full pattern of Terrorism within the United States and around the world. In the end, the only “pattern” that emerged was a mass of destroyed lives of innocent people imprisoned without charges or trials, for years…all because they were “Muzlems“. Like vultures to the dying, America’s politicians (mostly Republican Party) saw an opportunity to show their resolute concern for the US, by taking a bite out of Muslims, taking the jingoist bar to lows that had not been seen for decades in America; The Democratic Party, forever afraid of being labeled “weak”, maintained their silence, occasionally even joining the feast on the body-Muslim. Seeing opportunities to feather their nest of weapons and their budgets, law-enforcement agencies like the Police and FBI, across the United States, began to join the anti-Islam hysteria followed by the military, all of whom began to incorporate virulent anti-Islam and anti-Muslim messages in their training programs; even many Right-wing Churches and Synagogues found Islam-bashing irresistible. Today, organizations, websites and “experts” on Islam and “terrorism” (read ‘Muslims’) are blooming at exponential rates, like head lice in a jungle. The drums of persecution beat with growing ferocity and rise to regular crescendos at election time, when opportunistic politicians feel they need to raise a few extra points for their campaigns. In 2009, some Muslims purchased a damaged and abandoned building that had lain unsold for years, to build a Muslim community Center, about two blocks from Ground Zero (Twin Towers) site in New York. Their intention was to have the building be a bridge between faiths, permitting social activities to all faiths. The 13-story building is officially called the Cordoba Initiative, but it quickly became known as “Ground Zero Mosque” by its growing numbers of detractors. Watching bigotry hide its ugly face behind thin veils of civility, can be a most amusing pastime…as long as the bigotry is not aimed at one’s self. At first, leading politicians, primarily from the Republican Party, jumped in the fray, demanding to know the source of funding for the Islamic center..a question that is never posed for any of the tens of thousands of buildings that are bought, sold and built across the United States every year. Then rose questions of “sensitivity”, unrelated people speaking for the victims and their families, that a MUSLIM building, that close the “Hallowed Ground” of the Twin Towers site would be “hurtful”, “insulting” and “blasphemous” to the memories of the dead. 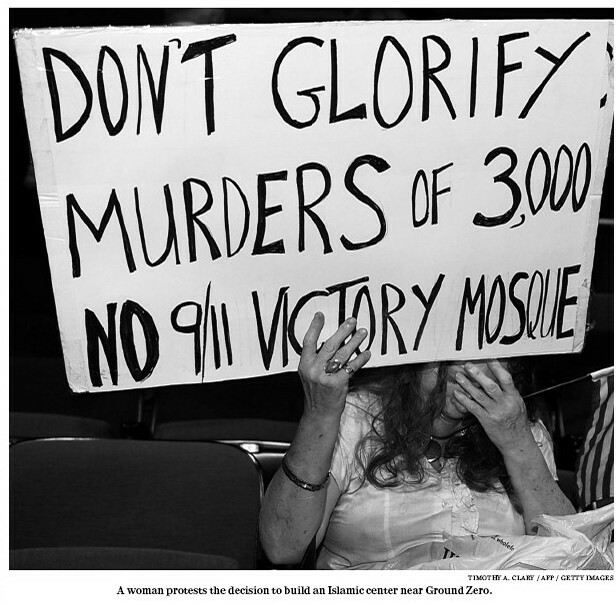 These messages were amplified by other opportunists and picked up by perfectly sincere people who did not bother to think about the thoughts being planted in their minds, by bigots; even some of the family members of the victims, have been manipulated into believing that a Muslim center at this proximity to Ground Zero, is “too close”…it is entirely possible for good people to be sincere and yet, reflect the bigotry manipulated into them by opportunists and bigots. Nobody has asked about the other victims of that disaster, whose names suggest they were Muslims; would it not be an insult to their memory that a building is being rejected simply because it will be housing Muslim activities? Other than discrimination and bigotry, which “shared values” would be “contradicted” by having Muslims build a center for healing, understanding and prayer? One is forced to ask Mr. Foxman if he would advocate the same for a Synagogue that was being opposed by people whose “sensitivities” were being injured by the presence of Jews in their midst or, if by inference, it would be okay the bring back the segregationist housing laws where Blacks were not allowed in communities in deference to the whites’ “sensitivities”? The ADL’s show of bigotry, moved Newsweek writer and CNN show host Fareed Zakaria, to return the ADL’s Hubert Humphrey Award for First Amendment Freedoms, along with the prize money…Zakaria was not generally known to take strong pro-Muslim positions in the past. Several gubernatorial candidates in the upcoming elections of 2010, have opposed the Islamic center and some have even gone the extra mile, by suggesting that ANYTHING Muslim, is a blight on this great country. New York’s Democrat Governor David Paterson joined the opposition to the center and in a show of generosity, offered to help move the center to another location, saying he “understands the resentment many feel” against Muslims. He joined the growing chorus by such dubious luminaries as Sarah Palin and Newt Gingrich who compared Muslims to Nazis. In the middle of the rush to dive into the gutter of bigotry, New York’s Mayor Michael Bloomberg emerged as a major hero. He made no bones about supporting the right of anyone to own and build on any property as long as it conformed to existing standards and the Islamic Center does, he added. Republican Party politicians saw an opportunity to attack Obama and the Democrats and weighed in…hard… against such support for “terrorism”. Within a day, Obama was backtracking as fast as a gutless politician can, saying “Muslims have the right to build a mosque near New York’s ground zero, but he did not say whether he believes it is a good idea to do so”, thus demonstrating the art of making a statement without saying anything. The pressure on Muslims is so great, that many Muslims are starting to suggest that maybe the center should be moved away in order to appease the “hurt feelings” of the bigots. These Muslims have not considered how far the humoring has to go; what if the bigots start demanding Muslims move away from other places where some non-Muslims may feel a Muslim presence is “inappropriate”? Already, an organization called “Stop Islamization of America” is fighting the construction of ANY Mosques, ANYWHERE in the United States. From that point, it is but a small step to banning the practice of Islam, to banning Muslim presence…and suddenly, the world starts looking like the rise of the Third Reich days. All arguments against the Cordoba Institute building or Park 51, as it has been renamed, must stop immediately. Those whose feeling are hurt by the presence of Muslims should be encouraged to get counseling in order to help them understand the irrationality of their response and the injustice being perpetrated in Muslims. Those leaders and show hosts who are opposing the center, should be told their vitriol has no place in civil society; this is America, where we seek to reach higher states of coexistence and equality…peace and brotherhood among Man. We must not sit silently hoping “someone should speak up against the bigots“, because WE…you and I, are the people who have to take this stand for justice, today, not “later”.